Seven thousand miles from Iowa, I sit around a table of Grinnellians and stare down at the bowl that has just been placed beside our bubbling hotpot. Inside it is an intact organ that looks awfully similar to a human brain, albeit a generously seasoned one. What have I gotten myself into, I wonder, as I poke the pig brain with a single chopstick. At the next table over, Garrett Wang ’20, Karin Cho ’20, and Kaity Moore ’20 chow down on a plate of duck blood tofu. Meanwhile, Alex Johnson ’20 turns a bright shade of pink and begins to cough. I shout across the room to ask if he is okay. Back at my table, Jackson Schulte ’20 takes an unceremonious bite of cerebrum and seems to emerge unfazed. So does Yanni Tsandilas ’20, who has family in Greece and likens the dish to lamb brain he has eaten there. This is the point of no return. With the whole group looking on, Hayworth points his camera at my face. I select the smallest morsel I can grasp with my chopsticks and swallow it whole. Snap. Snap. Gag. Snap. Relief. After downing my drink and furiously scrubbing all traces of brain matter from my chopsticks, I can’t help but crack a smile. “Was it worth it?” asks Francess Dunbar ’20. “As long as it makes it into The Grinnell Magazine,” I respond. Over spring break, 15 first-year students traveled to China as part of a Global Learning Program tutorial led by Jin Feng, professor of Chinese, and Todd Armstrong, professor of Russian. The class, Food, Culture, and Identity in China and Russia, explored foodways as a window into the history and culture of these two complex societies. 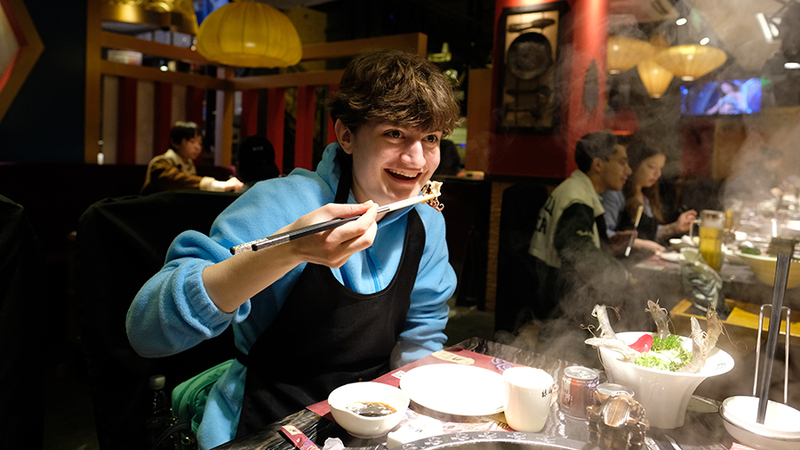 Rather than simply reading about food (after all, that would be cruel), the students experienced Chinese culinary culture firsthand. 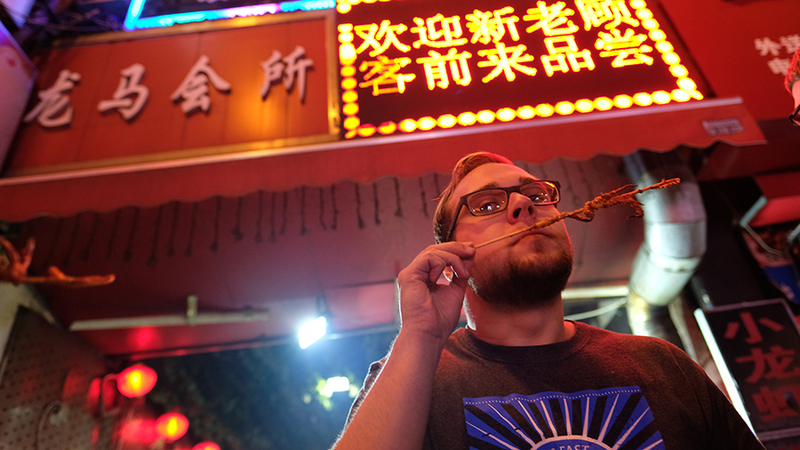 Over two weeks, they ate their way through Hangzhou, Nanjing, Suzhou, and Shanghai. Between meals, they also visited cultural sites, bonded with classmates and professors, and explored beyond the itinerary. As this issue went to print, the class kicked off summer break with two more weeks of course-embedded travel to the Russian cities of St. Petersburg, Moscow, Irkutsk, and Vladivostok. Hayworth and I were lucky enough to accompany the class for the first eight days of their trip to China. Undeniably the least adventurous eaters of the bunch, we nevertheless managed to get out of our comfort zones and sample a wide variety of Chinese cuisine. In the process, we explored a beautiful country and gained insight into one of Grinnell’s most exciting new academic initiatives. Our first stop is lunch at Kui Yuan Guan, a 150-year-old noodle restaurant of international acclaim. Feng leads the group into a private dining area, where two round tables await. Each is equipped with a Lazy Susan and topped with several cold dishes, served family-style. From the moment we pick up our chopsticks until we take our last bites, the dishes don’t stop coming. The staff are like whirling dervishes: serving the lotus root, clearing the duck tongue, pouring the tea, on and on until nearly 30 plates — per table — have been consumed. In the midst of this orchestrated chaos, I try my first Chinese delicacy: noodles with fried eel. To my pleasant surprise, it tastes more like beef jerky than seafood. I try another nibble before determining that I have had enough eel for one day. After lunch, we are invited to take a tour of the restaurant’s sprawling kitchens. 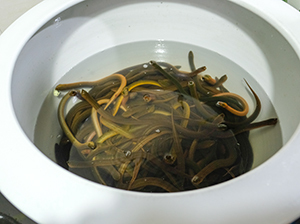 The highlight is a room featuring seven large basins of live baby eels. Someone inquires about the unusual preparation, and the manager lights up. 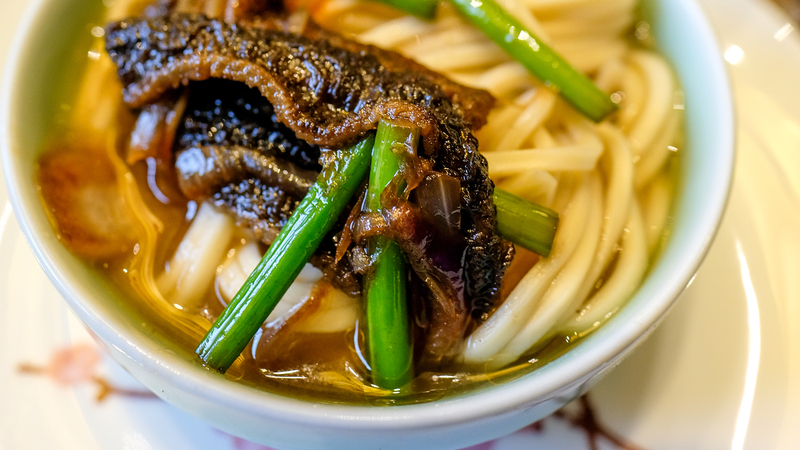 He launches into an explanation of the basins (the eels are kept for a week without food, which allows them to excrete any fishy-smelling substances) and shares Kui Yuan Guan’s secret method of cooking eel for maximum freshness. We leave our first meal with a heightened appreciation for the regional pride, rich culture, and meticulous attention to detail that characterizes Chinese cuisine. I, for one, am also appreciative to have tried the famous eel noodles before viewing the lineup for next week’s dinner. On our next day in China, we venture outside the city and into the tea plantations of rural Hangzhou. As the bus winds its way through sloping mountains, our tour guide, Kai, prepares us for the next series of stops. “TEA!” shouts everyone in unison. A former high school teacher, Kai is skilled in the art of coaxing responses from even the most reluctant of groups. Our first stop is the China National Tea Museum, which manages to pack a dizzying array of information into a surrealistically beautiful setting. With six halls and an open plan — there are no external walls, only enclosures of vegetation — it is easy to forget that you are inside a museum. 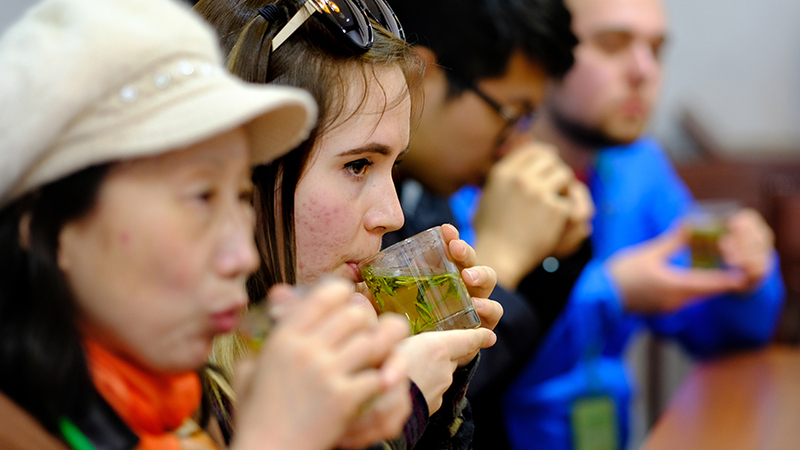 Venturing into the exhibition halls, we learn about the complex cha culture that has unfolded over millennia in China, the birthplace of tea. Various displays document the historical origins of tea, methods for its growing and processing, and its central role in a wide variety of social contexts and customs. Later on, we head to the Meijiawu Tea Village. Outside a traditional teahouse, we are greeted by a statue of Lu Yu, an eighth-century scholar who is considered the most influential figure in Chinese tea culture. Inside, we sip cups of Dragon Well tea, a prized variety of green tea that is native to the region. A skillful saleswoman demonstrates its antioxidant properties by pouring iodine into a glass of rice. When rinsed with water, the rice remains stained, but when soaked in the tea, it regains its white color. By the time she pitches a student discount, everyone is hooked. A full 18 members of our 20-person group leave the teahouse with tins big and small. Perhaps the tea will fail to work miracles, but at least we will take home a piece of our trip. At any rate, this is what I tell myself as I amble out with a large tin, a small tin, and two bottles of tea-based supplements. That evening, we head to the Hangzhou Cuisine Museum for a tour of Chinese food history. Like the class itself, the Cuisine Museum investigates and celebrates Chinese gastronomy — more specifically, the regional cuisine of Hangzhou over the past millennium — as a window into China’s history and culture. 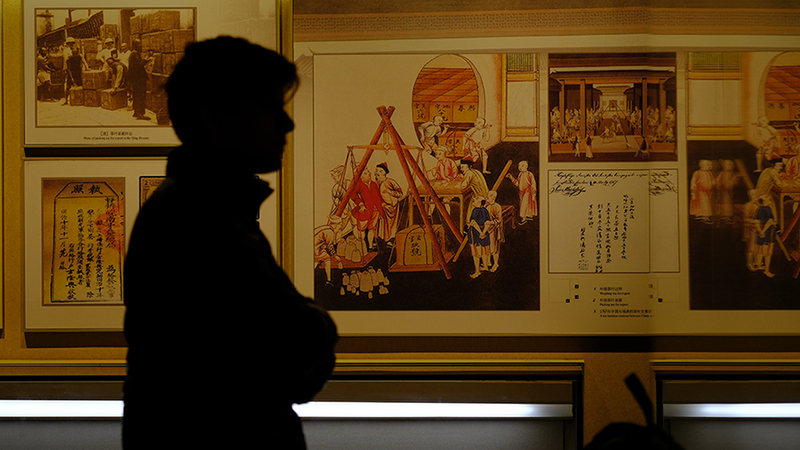 As we explore the museum, audio guides direct us through a series of exquisite exhibits. One features silica replicas of every dish served — over 40 in total — at a 12th-century banquet for Emperor Zhao Gou. Another documents the rise of food culture during the Southern Song Dynasty (1127–1279 C.E. ), when Silk Road migrants from the old capital of Kaifeng introduced Northern flavors into Hangzhou cuisine. By the time we have finished our tour, everyone’s stomachs are grumbling. Thankfully, dinner is not far away. A museum employee directs us to a private dining room, which has already been set to accommodate our group. We turn and look to find a Russian cookbook prominently displayed on the uppermost shelf. Whether or not this was a purposeful choice on the part of the restaurant staff, everyone appreciates the reminder of adventures to come. After filling our cups with Dragon Well tea, the waiters begin to deliver the dishes. From delicate melon to mandarin fish and pork belly prepared in Song Dynasty style, each plate is not only a rich slice of regional culture, but also a work of fine art. When the 30-course meal is finally over, we are treated to a visit from the head chef. Nobody is surprised to learn that he cooked for last year’s G-20 summit in Hangzhou; the food is that impressive. Feng presents him with a GLP class T-shirt, and we burst into applause. The next morning, we wake early for the three-hour trip to Nanjing, the former capital of the Republic of China. Although everyone is tired from a late night out, the professors ask the class to spend some time debriefing on the bus. One group discusses the biggest differences between Chinese and American food culture. Schulte and Dunbar note that Chinese meals are less open to customization; unlike in America, there is no such thing as “having it your way.” Johnson, meanwhile, is surprised by the sheer volume of food at each meal. We agree that this probably has something to do with nutritional value. Though fast food restaurants have multiplied across China in recent years, processed food remains far less common than it is in the United States. In China, most dishes are seasonal, regional, and generously spiced. At the other end of the bus, Gabriela Gryc ’20 brings up the topic of American privilege. When she, Steffie Ochoa ’20, and Caryn Crittenden ’20 stopped for a late night snack — at a McDonald’s, no less — the staff delayed closing so that the group could finish their meal. Another student mentions the difference between “meals in competition” versus “meals in conversation.” Compared to Americans, Chinese people place less of an emphasis on which region or city produces the “best” cuisine. Instead, they take pride that distinct regional styles can coexist. Finally, Katie Mehltretter ’20 shares that she is starting to get over her squeamishness. “It’s a lot easier to eat baby octopus outside of an American context,” she says. Thinking of the pig brain, I agree, but not without a slight shudder. The next morning, we leave the city and bus out to a rural village on the outskirts of Nanjing. The sky is still gray — thick with smog or rain, we cannot tell — but here, the streets are empty, and the rice paddies stretch for miles. There is a quiet beauty, but also an overwhelming feeling that this village has seen better days. Though the village has emptied out over the years, several dozen families remain. Walking through the streets, we encounter an adorable toddler, her grandfather, and multiple unleashed dogs. One affectionate mutt decides to follow us through town, circling our feet and barking our arrival to animals that eye us from the side of the road. The meal is simple, flavorful, and nutritious. In addition to the fish, there are spring greens, pork dumplings, and a hearty chicken soup, head and all. Gryc mentions that some plates remind her of her mother’s Polish cooking, and Kaspryzyk, who is also Polish, agrees. After a rainy visit to the mausoleum of Sun Yat-sen, founder of the Republic of China, we head back to Nanjing for dinner. In a nod to the city’s large Muslim population, the professors have selected a halal restaurant for tonight’s meal. We are joined by Karol Sadkowski ’16, who is teaching English on a Grinnell-sponsored fellowship in Nanjing. He also happens to be Armstrong’s godson. At an ornate table, we indulge in a variety of familiar and unfamiliar dishes. Per halal strictures, there is no pork, but we are served generous portions of beef, lamb, fish, dumplings, and vegetables. One dish features spiced beef intestines, which Tsandilas declares to be the best he has ever had. I am less enamored and gladly pass my plate to the more enthusiastic eaters. When the meal is over, the majority of the class follows Sadkowski back to his dorm. Several students remark that they could see themselves applying for the Nanjing English teaching fellowship after graduation, which prompts a grin from Sadkowski. “Do it,” he says, before leading us out of the building. Later on, we take a group trip to an American-themed bar and restaurant near Sadkowski’s dorm. Crowded around a table, we trade stories over plates of nachos, then sign our names and class years in a “Grinnell box” on the colorful wall. “It’s like Bob’s-in-China,” one student says, referring to the popular Grinnell campus hangout. Everyone agrees, and we are happy to be in the company of others who understand. Across the table, I catch Sadkowski’s eye and smile. On Hayworth’s and my last day in China, we visit two universities. The first, Nanjing Normal University, was founded on the site of a women’s college that informed Feng’s early research. As we tour the grounds, Feng shares the illustrious history of the 100-year-old institution. In addition to being the first college to grant bachelor’s degrees to female students in China, Ginling Women’s College also sheltered 10,000 women and children during the Nanking Massacre of 1937–1938. Next, we head to Nanjing University for a celebratory reunion lunch. Our class is joined by administrators and professors who have been involved with the Grinnell-Nanjing exchange, including many longtime friends of Feng and Armstrong. When toasts have been made and gifts exchanged, everyone spreads out to mingle before saying goodbyes. While Kasprzyk, who is studying Russian, picks the brain of a Russian professor from Nanjing, Wang and another professor discuss living and learning abroad. All in all, the reunion is a fitting tribute to the 30-year-old partnership between the two institutions, rooted in shared history, invigorated by fresh faces and the promise of collaboration to come. That evening, we dine at a restaurant in Nanjing’s Confucius Temple district. Like the rest of the city and China itself, Confucius Temple is a district of dualities. Though anchored by a historic Confucian temple, today the area is a bustling center of commerce, culture, and entertainment. Century-old medicine shops and cheap street food vendors abut underground markets, artisans selling crafts, and more than one Starbucks. New and old, rich and poor, modern and traditional — China is a dizzying blend of contradictions in flux. Most of all, it is a country that is growing, adapting, and very much alive. Seated around the dinner table for our final meal, Kai asks me and Hayworth what we will take from the trip. “I think it would have to be the experience of eating together,” Hayworth says, and I agree. The simple act of sitting around a table, sharing plates of food, and trying adventurous new dishes creates a sense of community that can be hard to come by in Western society. Did we learn about Chinese culture by studying its food? Certainly, the answer is yes. But we also learned about human culture — how shared dishes and rituals can bridge divides, invite conversations, and create space for community at Grinnell and abroad.